The Formula-E racing series was developed three years ago by the Fédération Internationale de l’Automobile (FIA) as a means to demonstrate the potential of sustainable mobility. The innovative all-electric, street racing series holds 12 races in nine countries, and is comprised of ten teams backed by some of the biggest names in motorsport – such as Audi, BMW, Jaguar, Renault, and Michelin. The latter is the sole supplier of tires to Formula-E, and the French company’s involvement with this new series reflects its long held belief that technology developed on the track can be directly applied to the products they will eventually offer to consumers. Michelin has been a leader in the development of automotive products for more than a century, and much of its success can be traced to its involvement in motorsport activities across the globe. “We have been involved with motorsport for many, many years,” said Pascal Couasnon, the company’s current Director of Motorsport. In fact, Michelin’s sporting involvement dates back as far as 1891, when the company used racing activities to demonstrate its innovative removable tire to the public for the first time. Michelin’s vast experience under these extreme conditions have resulted in the company being able to engineer a tire that is so durable that the competitors running Michelin tires break more wheels than suffer tire failures. This fact no doubt gives the consumer more confidence when they are considering outfitting their daily driver with Michelin tires. Michelin worked with the FIA to define a set of rules so that would allow the tire company to work on new challenges and extract the most benefit from its involvement with this fledgling series. The goal was to find the perfect balance between longevity and performance for Michelin’s future high-performance street tire offerings, and Formula-E offered the perfect arena in which this development could occur. The compound that Michelin developed for the Formula-E series provides exceptional grip for handling, and reduced rolling resistance to enhance fuel efficiency. This technology is already trickling down to the consumer as the Michelin Pilot Sport 4 uses the same tread pattern as the tire developed for the Formula-e cars, proving that the performance gains established by success on the racetrack are making their way to the company’s street tires in very short order. At the completion of the first season of Formula-E competition the teams approached Michelin and asked the company to hold off on changes to the tire as they liked the design, handling, and performance it offered. However, for the third season Michelin elected to continue the evolution of the design. “Our goal and mandate with the FIA was to produce a tire with similar performance potential and durability, but which was made using less material. The new tire we came up with is 1.2-1.3-kilograms lighter (each tire) than before and delivers a 15% improvement in rolling resistance.” These gains were largely achieved through alterations to the compound and the structure of the tire itself. So if Formula-E offers Michelin such beneficial opportunities for research and development, wouldn’t a pinnacle series like Formula 1 represent an even better test bed? Apparently not, given the current F1 regulations. “By offering limited specifications Michelin is able to bring costs under control (with regards to product supply and transport) for both the teams and ourselves. However, if there is exceptionally heavy rain at an event, we do have the capacity to provide the teams with a secondary tire that is better able to resist hydroplaning and channel surface water. This backup contingency may prevent a race from being red flagged due to weather. Formula-E is unique in that the races are relatively short (less than one hour) and require that each driver use two separate cars during the race. This is because there are no pit stops for refuelling and getting fresh tires. Instead, at the halfway point of the race the drivers will head to the pit lane and strap themselves into a second race car that is fitted with a fresh battery and tires. As a result, tires do not have to run a complete race distance, but each driver is limited to just eight tires for a race day. Practice, qualifying and the race itself all take place on a single day, and each driver must use both his cars in all sessions. Michelin does not engage in motorsport for short term gains, instead, they engage in such activities with an eye on the future. 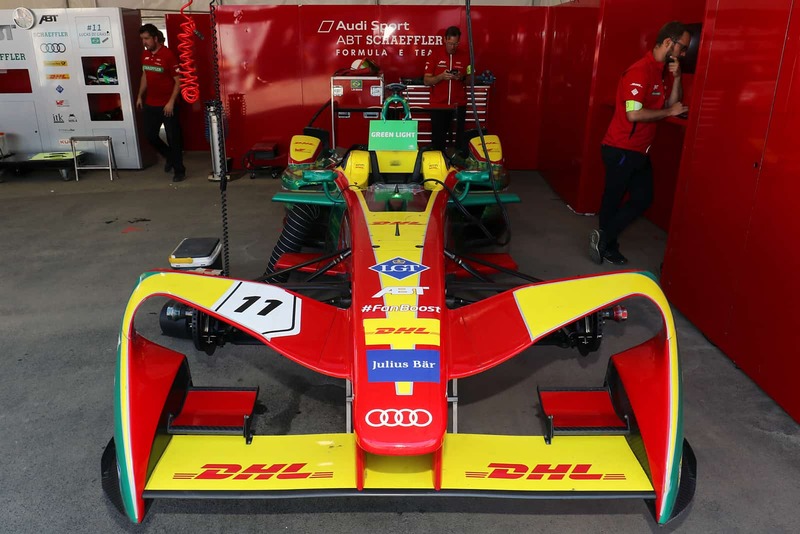 The reason that they have invested in the Formula-E series is to develop new technology and continue their pursuit of producing cutting-edge consumer products. With 3 flavours of the 2017 MINI Cooper convertible available, it's the 228-hp twin turbo-powered John Cooper Works model getting us excited.